The article’s impetus was this recent Pew Research/Smithsonian study called “U.S. Views of Technology and the Future” that said a third of Americans think there will be manned colonies on other planets by 2064. 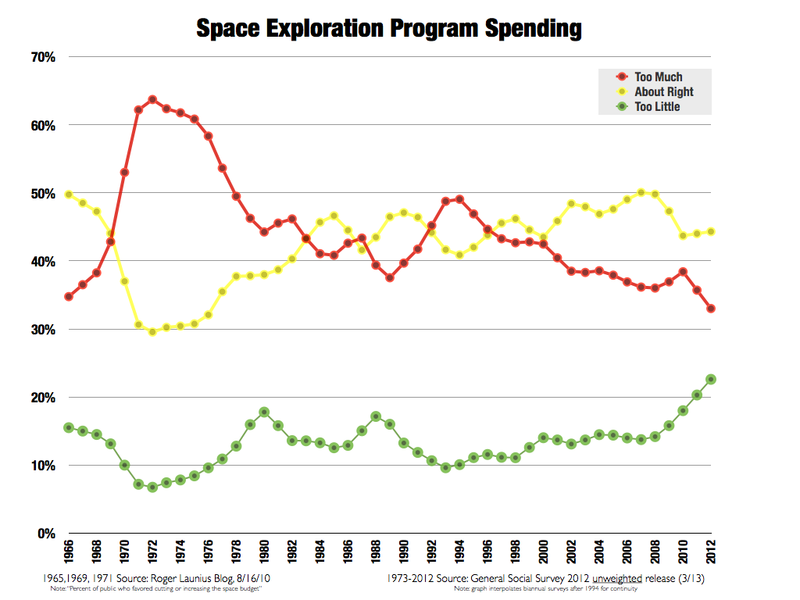 But long-range statistics from the National Opinion Research Center’s General Social Survey, Pew argues, demonstrate weak support for paying for space exploration. “We found that Americans are consistently more likely to say that the U.S. spends too much on space exploration than too little. At no time has more than 20% of the public said that the U.S. spends too little on space exploration,” Pew wrote in the article of the survey, which has been running for about 40 years. Not everyone agrees with that interpretation of those numbers. In a personal website blog post published in 2013 (after the last GSS came out) NASA employee Dennis Boccippio said that financial support for space exploration has never been higher. The blog post, which referred to preliminary data from the 2012 survey, showed “an overall higher favorability rating” that was stronger than any GSS survey or at points cited before then from the National Air and Space Museum’s Roger Launius. In particular, look at this graph that Boccippio published on his blog. “The GSS surveys consistently show a slightly lower favorability rating for the survey question variant ‘space exploration program’ versus ‘space exploration’ – but it’s very small. This may be one way to measure the difference between supporting the concept of exploration and supporting government programs,” Boccippio said in an e-mail to Universe Today. Boccippio is NASA’s manager of the center of strategic development at the Marshall Space Flight Center, but said he wrote the blog post as a private citizen. After an inquiry from Universe Today, Pew said part of the different interpretations could depend on “data analysis and weighting variations”, and added they made adjustments in the blog post to reflect those interpretations. “We relied on the Roper Center calculations of the GSS data, the blogger you cite used preliminary data … At the same time, the general point we made still holds. At no time in GSS surveying has the support for more spending topped the figure of those saying there should be reductions in spending,” said Lee Rainie, the director of Pew’s Research Center’s Internet & American Life Project, in an e-mail. Rainie also clarified that the space colonization survey did not necessarily ask respondents who would pay for it. “Our poll with the Smithsonian Magazine did not mention NASA in our question regarding long-term colonies on other planets, nor did our question suggest in any way who might perform planetary colonization,” he said. What do you make of the numbers? Again, you can view the two posts here and here.